In June, I wrote a flurry of posts about my trip to Paris and Amsterdam. 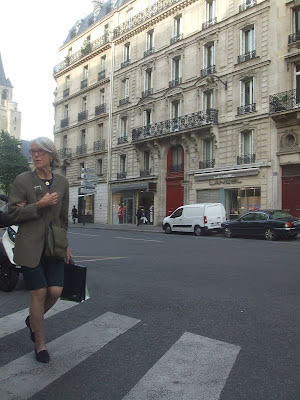 As mentioned, I was particularly taken by the style of over 50 French women. By and large, the best dress French women wore well-made clothes in combinations of neutral colors. Take, for instance, the French woman in the photo above. The black sheath and brown blazer are so simple and sophisticated. With July 4th almost here, we're all thinking about celebrating the red, white and blue. But the holiday is also a time for some of the biggest online sales of the year. Before you start celebrating our nation's independence, you might wish to browse the sales. I've put some links to big sales in the left-hand margin. For a few of my favorite neutral separates on sale right now, click "Read More." One of my favorite fashion trends over the past two years is the color block style. The blocking adds interest without being fussy or busy. It's a clean look that's perfect for women over 50. The Colour block shirt below is from the Pure Collection. I love this clothing site because it has a wide selection of neutral separates made of natural fibers. And right now, you'll find up to 50% off on the collection. A color block top like the one above will look smashing with linen slacks, a pencil skirt or a comfy knit skirt like the Knitted skirt below. While I saw a lot of solid neutral separates in Paris, many of them were combined with neutral prints. I've loved this Anne Klein Tonal Print Knit Cardigan for a while. However, now that it has been reduced from $89 to $39 with an additional 25% at checkout, it's calling me. The current mid-season sales are a great time to try a new look. But I like to use the sales to replenish some of my old favorites, like jeans and capris, as well. Take, for instance, these next Jones New York Easy Care 5 Pocket Twill Capri pants. They were original $59. Currently, they're $49 with an extra 40% off at check out. Over 60 Models: Fashion's "New Faces"
$59 Dress Sale at Jones--But Hurry!